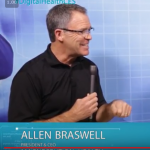 Allen Braswell sat down with Lygeia Ricciardi from the Digital Health Summit at CES 2017 to discuss the benefits provided by the Magnesphere. Lygeia started the interview with a joke that the Magnesphere “looked like a time machine” and she was not too far off! The Magnesphere addresses stress at the Autonomic Nervous System to help the body perform more optimally. The natural result is that a person can feel better than they have felt in years – as if they went back in time!